Over my years in the wine trade, I’ve tried so hard to avoid the mistakes that I perceive in many, many of those impenetrable wine weenies I encounter…and even some wine professionals. I don’t want to believe or pretend that my own tastes are universal; that I have all the answers about some particular wine or that my opinion of it should be the prevailing view. But that impulse, good as it may be at its heart, breeds confusion. In trying to see every viewpoint on a given wine, I ask if my own impression off some random Cabernet as tart and too tannic represents a set of flavors and textures that someone else would really love. If so, if I can believe that, I don’t want to simply dismiss it or refuse to review or sell it. My ongoing attempt to be even-handed has led me to drink a lot of wines that I frankly find lacking, in some aspect or other. And that’s largely the reason why I’ve seen beer almost completely replace wine as my evening pour of choice. I’ve said it a thousand times, by now: “I don’t want to drink anything just to be drinking. I want to have a great wine or no wine at all.” The working corollary to that statement is this one, “I’d rather have one really wonderful (beer)(glass of wine)(shot of Whiskey) than have two or three that are just okay.” And, because drinking nothing but exceptional wine is both logistically and financially difficult, I let my long-dormant Beer Freak out and set it loose. FACT: There is FAR more great beer around than there is great wine – and I am not talking about price. I’ve had fabulous wines that cost ten bucks and absolute crap that costs $75+. But, just last week, I got a bottle from UPS that reminded me forcefully of the reason I fell in love with wine in the first place. Faust is a second label of the Huneeus Family Wineries; a small but tightly-focused collection of truly great wineries owned by Agustin Huneeus, a Chilean transplant who came to Napa in the late 1980s and founded Quintessa, one of the world’s truly profound wines, sourced from its estate vineyards located at the intersection of Conn Creek Road and Silverado Trail in the heart of Napa Valley. 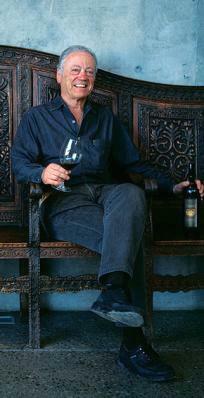 Obeying the same aesthetic that moved him to create Chile’s consistently excellent value winery, Veramonte, Huneeus wanted to make a real Napa Cabernet that average wine lovers could afford, without sacrificing the richness and opulence that makes Napa one of the world’s most sought-after Cabernet appellations. 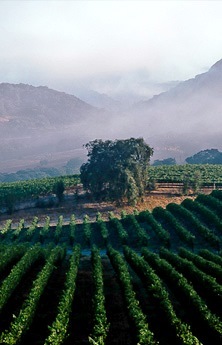 Faust is sourced from most of the Napa Valley’s most prestigious sub-regions and also from its own estate vineyard (pictured above), located in one of Cali’s newest appellations, Coombsville, at the foot of Atlas Peak. Though it’s not a single-vineyard or single-source wine, the character of Faust is absolutely Napa. It’s a big, generous Cabernet but is adamantly NOT one of those uber-lush, 30-Weight, “power Cabs”, for which Napa is frequently (and correctly) criticized. Faust is firmly fixed just short of lush and well past medium-bodied. It’s lithe, a word that might seem like glib, self-conscious reviewer-ese but perfectly sums up this lovely Cabernet. The flavors are Classic Napa: copious blackberry, raspberry liqueur, black currant, fig, Bing cherry, cola, and pipe tobacco, with grace notes of black tea, anise, vanilla, and blood orange atop a wonderful, tangy skein of sweet minerals and loam. This 2012 is almost ridiculously mature, for its tender age, and the promise of what’s to come after two, five, eight years of aging makes me almost giddy. The texture is surprisingly light, considering the palate-coating nature of the stuff, and it wears every bit as well for repeated drinking as most Walla Walla or Sonoma Cabs. Nineteen full months of aging in new French oak adds an unctuous smoothness and lovely wood character and the deft hands of Huneeus and his Head Winemaker, Quintessa veteran Charles Thomas, rein in Napa’s opulent fruit and maintains a gorgeous balance and – as much as I hate to use this term – elegance. It’s become almost an Event, for me, to sit and sip a wine that I can just purely enjoy; wallow in with hedonistic delight and not dissect like a pickled frog. With this wine – as with only certain rare bottles I’ve sampled in the past five to seven years – there’s plenty of opportunity to apply critical thinking but not the need to. Judye and I finished this the same night we opened it; something we almost never do, anymore, and my critical appreciation and knee-jerk analysis/note-taking took all of five minutes. The rest was just pleasure. I felt like a fat guy loosening his belt after a long siege of the all-you-can-eat buffet: relieved. Relieved of the obligation to always be The Critic. Relieved to have to rationalize absolutely nothing. Relieved to think that a wine like this, from a great Napa producer, can still be had for about $55. I know that’s a lot, still, especially when a bottle of Dunham Cab or Sleight Of Hand “Illusionist” Cab can be had for even less, but Faust, unlike releases from smaller wineries, is made in enough quantity that it will probably be possible for me – or you? – to enjoy it a couple of times without being required to invest in a case. The earth still offers up grapes, from not only Napa but nearly every growing region on the Earth, that are capable, in the right hands, of producing flavors and textures and sensations that let us touch that “little God”, for a few moments, and bolsters my own argument that one great glass of wine is infinitely preferable to a dozen merely good ones. Faust reminds me of what I loved about American Cabernet, in the first place, and what people of skill and dedication can still do when their values are their engines. ← Deschutes Jubelale 2014: A Little Extra Jubelation!